...with Cameron Carver. He is one of our excellent field trip leaders/bird guides that is a part of the Birds & Butterflies of the Big Bend festival. This event is coming up quickly; it will begin on the 19th of July. 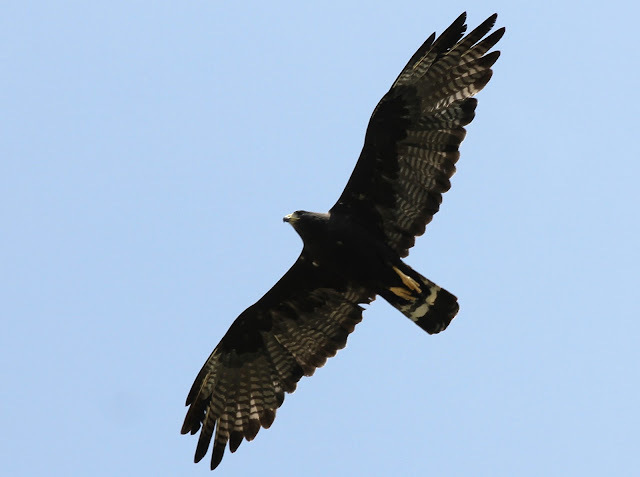 A question has been mumbled around the region (well, by a few of us) about where the Zone-tailed Hawks have gone. After all, last year was the worst drought in the entire state, much less the Big Bend region. Nevertheless, we are certainly used to seeing this Turkey Vulture psuedo-mimic around once in awhile. We were thrilled. Also exciting was adding this species, with a couple of others, to the Maravillas Ranch possible species list for the festival. Our day on this property south of Marathon was to scout a couple of locations I had yet to visit, while orienting Cameron to parts of the property. Had this been an exercise in recording the most species we could, our total would have been higher. still just paired up, from my obs. FOY for MY. First of prop for MY, in location previously un-searched. 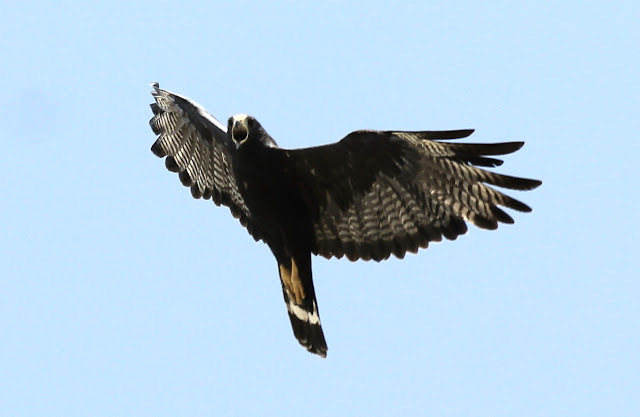 This bird has been abnormally scarce for the region, this year,... generally. FOY. First of property for MY. conservatively. Did not search extensively. !st HY's may have dispersed. lakehouse. one female on nest, HY's from Lakehouse first nest seemed dispersed. Ad. male, female. 3 HY's. scraggly oak motte on w.side of road, heading to lakehouse. heard only. maybe 3. heat of the day. Good habitat patch was finally surveyed. Biggest find of the day probably, as there aren't too many (accessible??) scrub-jay locations in Brewster Co. First of property. Found in previously un-surveyed location. However, location was thought to be promising for this species. heard only. Did not pursue this trip. not as many singing this particular morning. vocalizing male on territory. Same location. numbers have increased in two weeks. Several singing males. certainly more. Often vocalizing. Only observed adults. Definitely a favorite species, to go along with its Genus mate, (S. zampa) Arizona Powdered-Skipper. Both of which are found in our area. Both of which have been found at Maravillas Ranch. We also encountered this guy once more, or an individual like it. There's lots of butterflying (is that the proper verb?) in Arizona, but nobody seems to combine it with birding on one site like you all do. I was wondering, have you ever had to choose a side between the birds and the butterflies? I'm assuming that at some point, predatory birds have turned their sights on the butterflies, and maybe some of the larger butterflies have slurped up a bird every now and again? Does it make you cringe when a butterfly gets chomped, or does the satisfaction of knowing "it's just nature" cool your ire? Choosing sides isn't really an issue - it's just cool to see life as it happens. We've seen some weird stuff, like a mated pair of sulphur butterflies flying around, except something had snacked half of one of them. It's nature. We're privileged to see it. Except the butterfly slurping a bird, we have not seen that - but it would be AWESOME. That semi-snacked butterfly sounds like a war hero. "Does it make you cringe when a butterfly gets chomped, or does the satisfaction of knowing "it's just nature" cool your ire?" Only thing about a bird snacking on a butterfly is when it's during an inappropriate time. I'm leading a kids group around and talking butterflies. I say, "the Queen butterfly eats milkweed as a caterpillar. You are what you eat, right guys? So as an adult, the Queen's orange color acts as a warning, 'Do not eat me as I will give you a 'tummy ache'." So, birds know to avoid certain butterflies." Then, a Northern Mocking swoops down and snacks a Queen. Ha! This is the best example of a Mockingbird living up to its namesake I've ever heard.